Grouse hunting in the U.S. is dominated by two species of birds, the ruffed and sharp-tailed varieties, but the northern woodlands of the U.S. and Canada are home to another species of grouse, the spruce grouse, which offers some exceptional hunting opportunities. The spruce grouse, as its names implies, is partial to black spruce and jack-pine forests. The bird’s range runs roughly across the far northern reaches of the U.S. into Canada, and west into Alaska. During the 19th Century, spruce grouse were abundant in most northern woodlands, but excessive logging severely reduced the bird’s habitat in some areas, and subsequently its numbers. 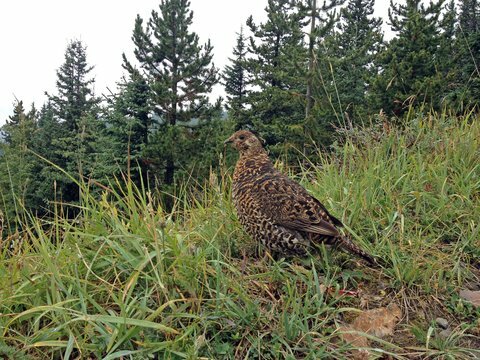 As the northern forests were replanted, spruce grouse numbers gradually improved. Today their range supports fairly healthy populations, which offer good opportunities for hunters. The spruce grouse shares some of the same habitat as the ruffed grouse and blue grouse, and the hens bear some similarities in appearance, but it is difficult to confuse the males of the species. The male spruce grouse has colorful splashes of red, yellow and white on its head, and a much darker body. Although they share some of the same habitat, ruffed and spruce grouse do not share the same behavior traits. Hunters who have encountered both birds know their reaction to humans is quite different. Ruffed grouse tend to flee when they encounter a hunter, but the spruce grouse’s main tactic in avoiding predators is to freeze. The bird’s tendency to stand still in the face of danger has earned it the nickname of the “fool’s hen”. It has reputation for being stupid, but the spruce grouse is very adept at avoiding its natural predators. During the late fall and winter the spruce grouse is arboreal. That is, it lives mainly in trees and does not flush as readily as a ruffed grouse. Because they do not flush, it tends to be frustrating for hunters. In areas where the ruffed and spruce grouse ranges overlap, far more ruffed grouse are harvested by hunters, in part because spruce grouse populations are lower, but that is not the only reason. Spruce grouse can be much more difficult to find within their range, because they prefer more remote areas, which are harder for hunters to access. Many grouse hunters go out specifically in search of the spruce grouse, because the males have such an unusual appearance compared to other grouse species. While grouse are generally considered good-eating birds, the spruce grouse’s popularity suffers from a reputation of being a poor bird to eat. The adult birds tend to take on a taste of pine, because they eat a lot of needles. However, that is not true of the young-of-the-year birds. They are excellent to eat, because they eat insects, herbs and berries, and have not gone through a winter where they eat only needles. Hunters looking for spruce grouse should concentrate their efforts on specific habitat. Areas with both jack pine and black spruce are good. In addition, the birds like peat lands with black spruce. They may also be found in areas with deciduous trees, near their ideal habitat of spruce and pine. Typically they will be tight to cover, often near the edges of timber stands or roadsides. While dogs can be a benefit when hunting ruffed grouse, they can work against a hunter when pursuing spruce grouse. A dog can drive the spruce grouse high up into the trees, where they are nearly impossible to hit. The best shotguns for spruce grouse are 12 or 20 gauge, with a shot size of 6 or 7 ½.
next articleHow Long Should You Fish a Spot Before Moving On?